Welcome to a new round of Macro Flower Saturday! I hope you are all having a wonderful weekend. This year, we have a beautiful, long autumn (so far), with bright sunny days and no rain. At this time of the year, almost all our flowers are gone, except a few stubborn wildflower, which don't mind the light frost during nights. A part of the world never sees winter and continues blooming all year round, so I hope we will see many interesting flowers from these countries, while ours rest. However, winter will not stop us from taking flower photos; I'm sure, you have many, gorgeous potted flowers. My photo reserves for winter are mainly house plants and cut flowers. 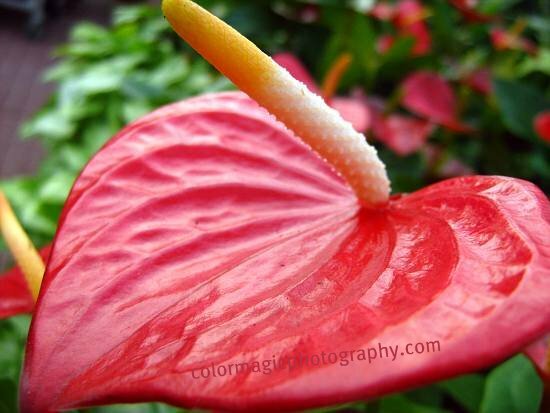 For starters, I share this bright red Anthurium lily, also called the Flamingo flower. It is a common flower, for most of you, thought is has a very interesting structure. The waxy, heart shaped petals of the Anthurium make the impression of an artificial flower. They come in many colors, from pure white, all shades of pink and reds, orange and even green. I share with you just the red one today but I'll post Anthuriums of other colors too, in future post. I always love anthurium lily! Love the heart shape. This one is so shiny red! Beautiful! Thanks again for hosting MFS. Yes, we have that a lot in my country but not in my house. Maybe I should have one planted because it is really beautiful! I prefer the white ones. How beautiful! Such a great macro! I've still got some flowers holding on! Hopefully it will last a while. This is just exquisite, Maia. I've only seen one before. Your shots capture the sheer essence of these beauties. Beautiful shots of these lily peace, or mauna loa and that's what they called here! Love the deep red color in these wonderful photos! What a neat photo - I never looked at this flower all this close before. You did it justice! Great job! I took some pictures of these same flowers the other day! These get even more popular coming up to Christmas especially the red ones. They have such long lasting flowers too. They really hate getting chills and their leaves go brown so if you buy one keep it covered when leaving the shop and don't leave it in the car for any length of time especially on cold days. Your photos are lovely Maia. I have always liked the Anthurium Lily but have never tried to grow one. Your macros are beautiful Maia. Thank you for providing this beautiful challenge each week! 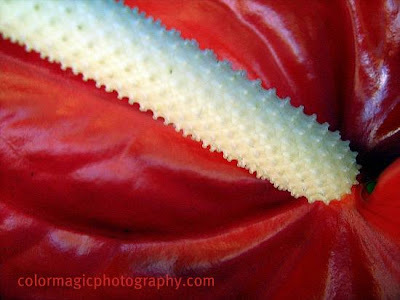 Your flower photographs are so lovely....truly inspirational. Such a nice bright red color! I agree, they give the impression that they're fake because of the texture and the shape. Thank you for an intresting challenge! Beautiful pictures, I especially like the second one. One thing I love about this flower is their heart shape. Your photos are so vivid!